This week I take a look at a few of the most significant aromatic hop oils and the role they play in beer. 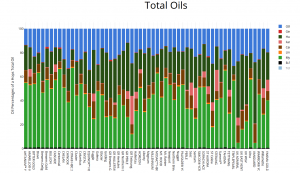 I also found a great link to an interactive chart where you can explore the oil content of many hop varieties. Hop oils contain well over 500 flavor compounds, many of which are transformed during brewing, fermentation and aging in interesting ways. Most brewers are familiar with alpha acids, represented by the alpha percentage shown on the package. These alpha acids are isomerized during the boil (or steep/whirlpool at high temperature) to provide the majority of the bitterness we taste in beer. Of great interest in recent years are the more delicate aromatic hop oils in hops. These compounds provide a lot of the hop character and aroma we associate with modern craft beers, and are especially critical in the recent wave of India Pale Ales. Aromatic hop oils, by there very nature, hard to get into solution and difficult to keep in solution. Being aromatic, these compounds are all somewhat insoluble and like to volatilize or have low boiling points. That’s why they don’t do well in the boil and require a whirlpool/steep or dry hop addition to maintain their aromatic punch. Myrcene – The most significant hop oil, making up from 30-60% of total hop oils in most varieties. Myrcene is often described as the “fresh hop oil” and has flavors and aroma varying from herbaceous to resinous, green, balsamic, and slightly metallic. It is a major component in many hop varieties from the Pacific Northwest, and is therefore a critical oil in IPAs. Cascade, for example has a myrcene content of nearly 60%. Myrcene has a low boiling point and is highly volatile. In fact it will virtually disappear in most boil additions, and even tends to be volatile in higher temperature whirlpool/steeping additions. It also oxidizes very rapidly, and is probably best used in dry hop applications. Humulene – The second largest hop oil by percentage, humulene makes up between 12% and 50% of total hop oils. 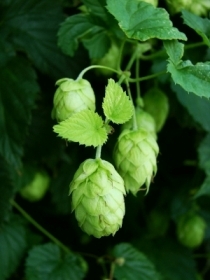 Humulene is responsible for earthy and spicy flavors found in traditional noble hops. While humulene has a higher boiling point (around 210 F or 98.9 C), it is very volatile and hydrophobic, so it is still best used in the whirlpool or dry hopping. Humulene is also easily oxidized, though the oxidized humulene-epoxide III play a major role in the flavor of varieties like Hallertauer Mittelfrüh. Caryophyllene- Caryophyllene makes up between 6% and 15% of total hop oils in most varieties. It is a major compound in many aromatic plants including cloves, cannabis, rosemary, and hops. It is also a major aromatic compound in black pepper. The aroma is described as woody, earthy, and peppery though it also has a strong herbal component. The spicy, woody aroma is often evident when you crush dried hops in your hands. Many English hop varieties such as East Kent Goldings have the largest percentage of caryphyllene giving them a woody, earthy finish. While not quite as volatile as myrcene, caryophyllene it will boil quickly and is best used in the whirlpool or as a dry hop. That covers the “big three” aromatic hop oils. In part 2 next week I’ll cover some of the smaller, but still significant hop oils. I do highly recommend you click on the hop chart above which has some great data for popular varieties. Is there a part 2 of this article? I cannot find it anywhere.